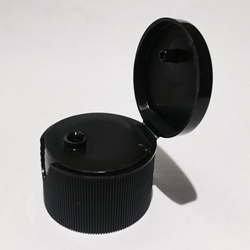 12 pack of: 28-410 PCO Black Polypropylene Fliptop Caps with .125 ORIFICE (UNLINED). Although we recommend that customers do not use the PET for long-term storage (See Long-Term Storage FAQ here), we are offering these as an accessory to accompany our new 4oz & 16oz PET Bottles for ease of use. These can also be sold in larger quantities by request.